April 29, 2016 March 7, 2019 kimnewswanger1 Comment on CULL….A Four-Letter Word? 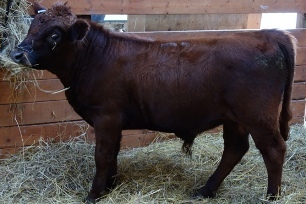 Taquito is a nice looking steer calf…but not breeding material. Being a responsible Dexter breeder & breeding for improvement in your herd often requires culling animals that don’t measure up to the standard. Unfortunately, it seems that some Dexter folks think cull is a four-letter cuss word. They’d rather sell every single calf that hits the ground on their farm as registered breeding stock than even think about culling. And that tendency is not doing the breed any favors. 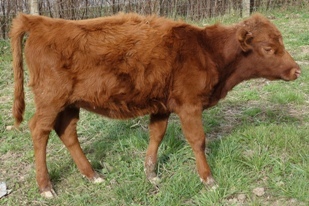 The reality of breeding is that, no matter how excellent your breeding stock, some matings just don’t work out so well in the genetics gamble, and you end up with a poor quality calf. Sometimes the best answer is simply “beef…it’s what’s for dinner”. Thomas, at 6mo, showed great conformation, muscling & his sire’s wonderful temperament. Just what we’re looking for in a breeding bull. 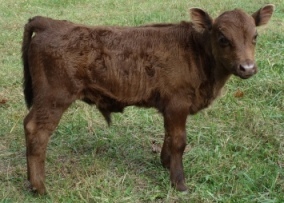 Bull calves are the most obvious, and most important, place to start with culling. Cattle industry standard is that only the top 5-10% of your yearly bull calf crop should be retained, intact, as breeding stock. The remaining 90-95% of your bull calves should be castrated & raised as beef each year. It should only be the “best of the best” boys that are making the cut as breeding stock. This is because a herd bull is 50% of your breeding program, and has a huge influence on the genetics of the herd. Poor specimens simply don’t need to be in that position. I think it’s safe to say that nobody’s herd consistently produces bull calves that are ALL high enough quality to be breeding stock, and yet you will notice some Dexter owners who register nearly every bull calf produced in their herd (certainly more than 10%), which raises questions in my mind. The Dexter market is always flooded with young bulls people are trying to sell…instead of culling as they probably should. 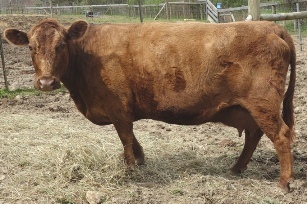 Lucky has everything we want in a “bull mother”: excellent structure, a lovely udder & a great temperament. So, how does a breeder determine which bull calves remain as breeding stock? I start by evaluating my cows….their conformation, disposition, and especially their udder. For a cow to be considered as a “bull mother” she must meet a higher standard than I normally expect for my breeding cows. If she doesn’t meet my minimum requirements for a “bull mother”, I simply will not keep a bull calf out of her, no matter how nice looking he is. When a cow that meets the standard gives me a bull calf, then the next step is to evaluate the calf based on his own conformation, disposition and breeding equipment. And I expect to see excellence if one of my boys will be kept for breeding. That’s why I’ve only registered two in nine years of breeding! The same traits that landed this scrawny heifer’s dam in the freezer are getting her culled as well: bad conformation, too narrow, cow hocked & a poor disposition. However, we don’t restrict our culling to only bull calves. Sometimes we have more customer demand for beef than we have steers available, so that gives us the opportunity to clean out the bottom of the barrel in the heifer crop. Yes, we’ve had some pretty poor quality heifers that I don’t want kept as breeding stock….I’d be embarrassed to have my name on them as breeder, so into the freezer they go. It tastes the same as a steer, and is an equally good thing for the gene pool. Once again, I use my evaluation system to score my heifers. If one doesn’t meet my minimum standard for breeding stock, she gets raised as beef from the start. Sometimes I don’t make the call on a lower-quality-but-possibly-OK heifer until after she’s calved the first time & I see her udder. By culling in this way, only keeping the best bull calves & eliminating the worst heifers, you can improve your herd faster. And selling Dexter beef is good for business, too! So don’t be afraid to use this four-letter word. It’s in the best interest of our breed. Glad to see this article – you work hard for the breed !